You are cordially invited to join the Chandeliers & Champagne girls for a glamorous Red Carpet Botox evening event! It's that time again, The Toronto International Film Festival....join in the festivities and beautify yourself as the hottest celebs in the world will be in town hitting the red carpets! 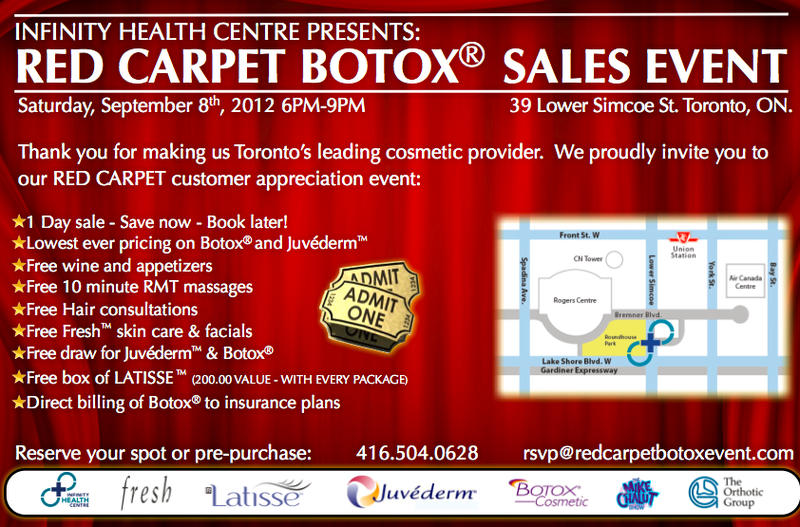 Infinity Health Centre Toronto is hosting an amazing night of beauty and cocktails from fresh skin care & facials, hair consultations, massages, botox & filler, to food & wine! This is the ultimate women's event! Bring your gfs and join in on the fun with us. 6. Dr Sharman is a leading injector of Botox and teaches at the university of Toronto and trains other doctors on proper injection technique.